From the Marvel UK line comes Death 3. Prometheus Unhinged! Part 1 of 4. Welcome to Los Angeles 2021 AD. 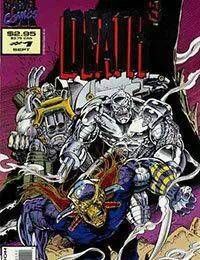 Former AIM (Advanced Idea Mechanics) member and head developer of the Minion Project (see Deaths Head II (1992/03-06) #1-4), Doctor Evelyn Necker has just created the ultimate weapon, the rogue cyborg known as Death Metal. The only problem is Neckers creation has a mind of its own.